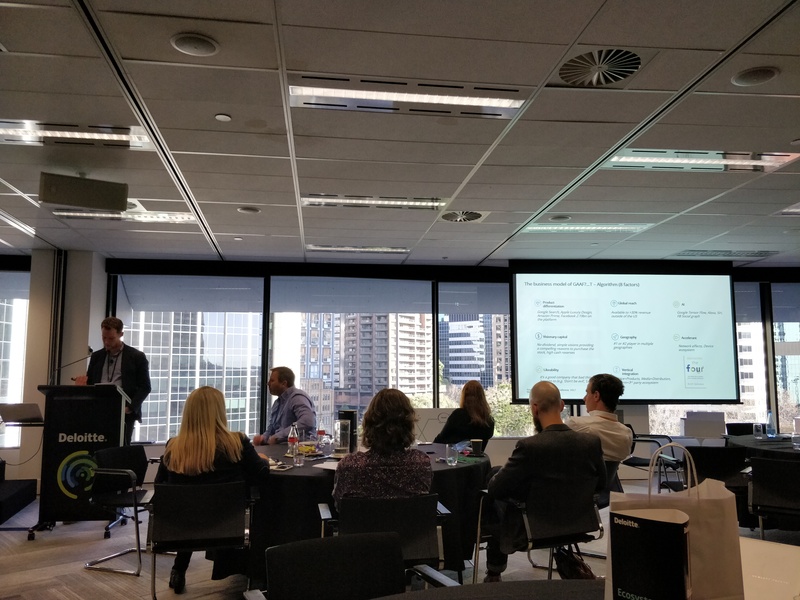 This is an excerpt of a talk I recently gave at Deloitte Australia’s TMT Summit, an annual event where our TMT (Telecommunications, Media and Technology) community and thought leaders in the sector come together to discuss the topics facing Australian and global TMT organisations. The conference focused on the topic of Industry 4.0 and looked at themes such as the enabling smart cities, better health outcomes and mobility as well as the introduction of new technologies, Flexible Consumption Models and new privacy laws. The talk was aimed at describing the nature of business models and platforms in 2018, their definition, how they have changed over time and how TMT organisations should consider new business models and platforms as they launch new technologies, look to transform with emerging and evolving technologies or look for new ways to make money. Firstly, a quick look at the definitions of business models, platforms and ecosystems. ‘Business models are like art… they are difficult to describe but you know it when you see it’. If you do your research on definitions of business models it can be difficult to pin down a precise definition. Wikipedia defines it as “a plan for the successful operation of a business, identifying sources of revenue, the intended customer base, products, and details of financing”, godfather of management theory Peter Drucker defines a business model as “Assumptions about what a company gets paid for” and Joan Margretta former ‘Strategy Editor for HBR’ explains it in two questions “how do we make money in this business? What is the underlying economic logic that explains how we can deliver value to customers at an appropriate cost?” Boiling it down… it is genre of artworks that have 3 core elements, assumptions about making money that lead to a plan to do just that. If you are looking for examples of these, there are a few short business model descriptions neatly describe in the book ‘Seizing the Whitespace’ by Mark W Johnson. Doblin’s 10 types of innovation method also describes profit model types that can be adapted along with the other types of innovation in the process of getting tactical in changing an existing business or looking to create new opportunities. Connected to business models, particularly those of the last ten to twenty years, is the concept of platforms. Deloitte has some of the most compelling literature on the definitions, characteristics and applications of platforms. John Hagel proposes that a platform can be defined as “layers of infrastructure that impose standards on a system in which many separate entities can operate for their own gains” the features of a platform being a governance structure and a standard set of principles or protocols for communicating, coordinating and collaborating. Deloitte identifies 4 common types of platforms – those which aggregate (think of these as market places in their most basic form), those which facilitate social interactions (a social network or communication platform like Whatsapp or We Chat), those which mobilise action (get up, bang the table, kickstarter, Brigade) and those that support learning at scale (think Slack, Trello, Medium, Wikipedia) which can combine a mix of productivity, information resources and structured learning. To win in a platform world?…Occupy influence points on the platform. The theory goes that the greatest opportunities for value capture on platforms are at points that tend to emerge whenever and wherever relationships begin to concentrate on platforms. By having privileged access to a larger and more diverse array of knowledge flows, the company occupying an influence point has an opportunity to anticipate what’s going to happen by seeing signals before anyone else does. That company is also better positioned to shape these flows in ways that can strengthen its position and provide greater leverage. In the last 20 years, the increasing maturity and penetration of the internet, mobile internet and consumer technology have given rise to multiple influence points which organisations have sought to occupy, build enormous castles, surrounded by formidable moats. In 2018, it is abundantly clear (in a way that it was not only 4-5 years ago) that there is a stark contrast between ‘aggregator platforms’ and platforms in the Hagel sense of the word. Platforms like the ones Hagel has described rely on 3rd parties to occupy influence points which in turn make them useful and gives them an ability to build their moat through the creation of an ecosystem. Think of Apple’s ‘App Store’ which turned 10 last week as an example, where third party applications occupy influence points in an ecosystem facilitated (somewhat rigidly by Apple). There are now over 2 million apps of which very few are Apple proprietary apps. Aggregators on the other hand attract end users by virtue of their inherent usefulness and, over time, leave suppliers no choice but to follow the Aggregators’ dictates if they wish to reach end users. Facebook, Amazon each display this characteristic with their core platforms… for Facebook it is news media and Amazon it is suppliers of goods, for Google its any business wanting to be found on search. So now that we have definitions for business models, platforms, aggregators and ecosystems. Let’s look at how these are playing out in 2018 in the world of TMT. The market capitalisation of Tech stocks is a good proxy for the looking at the value created by Tech companies. There is a lot to consider on this chart: technology change, economic cycles, elections, a financial crisis but the most interesting thing to ponder is the role of business models in the relative value of Tech stocks to the economy. We could split this into thirds but I’m going to look at the bubble in 1999 and today where Tech is 25% of the total market capitalisation. By the way… doesn’t this look familiar? It has a similar shape to the Gartner Hype Cycle for emerging technologies. It might just be a coincidence but one could say that we have perhaps finally hit a ‘plateau of productivity’ for many of the technologies that were on the peak of inflated expectations in 1997-1999. There were a number of really good ideas during the dot.com bubble that just didn’t make it. Flooz was not one of them. Flooz.com sold online currency that could be used instead of credit cards. After users bought enough Flooz, they could spend it at participating online stores like Tower Records or Barnes & Noble. Despite the questionable merits of this business, Flooz.com raised $35 million from investors. Corporate partners Cisco and Delta Air Lines used Flooz for corporate gifts. Flooz also spent $8 million on an ad campaign featuring Whoopi Goldberg and went Flooz went bankrupt in August 2001, less than two years after it opened its virtual doors. Webvan, an online grocery shop with delivery, was an idea that would seem like a no-brainer in 2018 and ebay the e-commerce marketplace was the killer application of Web 1.0 and persists today. Fast forward to the other end of our chart. There is no Flooz, Webvan or ebay but 5 dominant organisations only one of which was in the list of top 5 most valuable companies in 1997. I can’t help but feel that ebay missed the boat that these 5 companies sailed away on. But there is a way to perhaps interpret where ebay wasn’t able to adapt quickly enough. The business model of each of the GAAF is complex, this is the nature of TMT businesses in 2018. Product differentiation: each of the four identify where technology can add value, or remove pain from the process/experience of purchasing and each try to offer more for less – e.g. free delivery, the ‘best’ phone+OS, any answer you want for free, all your friends on one platform. Visionary capital: each of the four has the ability to attract cheap capital through the articulation of a vision that is easy to understand. Amazon doesn’t pay dividends, Google’s vision of organising the world’s information and Facebook’s vision of connecting the world are pretty compelling reasons to buy the stocks. Apple has over $250bn in cash reserves. Likeability: “When the news is negative, you want to be perceived as a good company to which a bad thing has happened”. If you watched Mark Zuckerberg in his congressional hearing he got away pretty lightly. And if you don’t like Mark then find me someone who doesn’t like Sheryl Sandberg or for that matter who has a problem with ‘Leaning In’. Both of them are still at the company despite the scandal. The same could be said for the crazy but fun ‘don’t be evil’ Larry Page at Google or ‘im going to space’ Bezos or the cult that surrounds Apple. In Australia, there are very few of our local listed companies that could claim to be developing even a few of these 8 factors. In fact, many may find it difficult to achieve 1 or 2 due to their incumbent position, sector orientation, investor pressures or the regulatory environment. The business models of many of these organisations are actually born out of positions of relatively little competition which are in some cases over one hundred years old. In 2018 the business models that will generate a 1 trillion dollar valuation are most likely out of the reach of incumbent organisations unless they completely reinvent themselves, like Microsoft is doing or buy their way into it, like AT&T and Time Warner. In 2018, the assumptions and therefore the requirements to make a lot of money are understandably only available to a few. So what hope do businesses have? There is one other factor to consider…a TED Talk given by Bill Gross founder of the incubator Idealab gives us some clues. He studied the success and failure of over 100 companies and attributed the outcome to 1 of 5 factors. Timing is the most important factor closely followed by execution. As companies continue to experiment with Industry 4.0, and the new technologies that will enable it, they should also look to experiment with new business models that will unlock the value of these technology shifts. In doing so, they should be aware of the new rules in value creation dictated by platforms and ecosystems but also consider the number one and two factor for executing on the assumptions for making money and the plan to do so are timing and execution.